You're not a party of one. You're a party for one. It's past 6 pm, you're hungry. Nothing is in the house. You still have your work clothes on and you don't dare look in the freezer. Fast food, no. Fruit, not substantial enough. I guess it's time to go out. But there is no one to go out with. So you grab your keys and head to a nearby restaurant and ask for the dreaded "Table for one" - Here are some tips for dining alone. Step one is to not turn the evening into a pity party. That can lead to excessive drinking and you'll be in more of a mess than when you left the house. Have a party attitude, without the party - if you know what I mean. Sit at a table, not at the bar. You'll feel more dignified and you'll get better service and not have to deal with all of the chatter at the bar. What I do is try to have fun. I make sure I know the names of everyone who is serving me - the maître d', the hostess, your server or servers, even the bus boy. I make casual conversation with them, focusing on asking them questions about the restaurant - how long have they been in business, is this a busy night, what is their specialty, can they recommend anything? If you're alone, you may as well make some new friends. Take your phone, you can kill time texting or calling someone. If you have a smartphone, you can even look up how the restaurant is rated. Order an appetizer and take your time with it. Let your server know that you are not in a hurry and you'll let him or her know when you're ready to order your entrée. Relax, that is probably the most important part. Be adventurous, try something you may have never tried before. The more you concentrate on trying to make a night alone an experience, the better off you'll be. Savor your meal. Take small bites and don't be afraid to look around the room. You may make eye contact with someone interesting. But enjoy the meal. You're not feeding yourself, you are dining. My former wife and I were good diners. We always took our time. Waiters and waitresses would often comment about how relaxed we were and how we "dined well". Too many people are in a rush, gulping down their food, waiving for the check and getting out within an hour. Learn to bask in the moment. It's you. You're the best person you know. If you learn to "dine well" by yourself, wait until you get a partner. You can teach them by example what it is like to enjoy the moment. It may be a party of one. But it is also a party of fun - only if you make it that way. So, don't dread the, "Table for one." 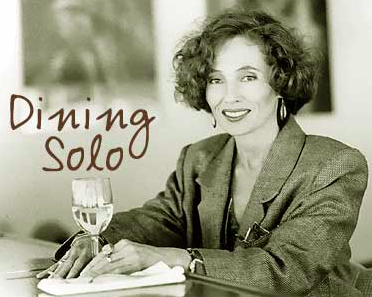 - Take these tips on dining alone and you will have a much more enjoyable experience. And tip well. If you come back, you'll get the best service you could imagine. And that in itself is half the fun.